DARGAN COGGSHALL’S legal troubles began in June 2010, when he and his brother-in-law, Frank Garden, decided to fish on the Jackson River near the home of Dr. John Feldenzer, a surgeon from Roanoke. River’s Edge owner Matt Sponaugle, who had sold the riverfront property to the Feldenzers, insisted that the anglers leave that section of the river immediately, pointing to the “no trespassing” signs—posted on the banks of both sides of the river—that indicated that neither fishing nor wading was allowed there. Coggeshall, who had fished that part of the Jackson for years, countered that his map, issued by the Virginia Department of Game and Inland Fisheries (VDGIF), listed this section of the Jackson River as public property. Eventually Sponaugle called for an Alleghany County deputy sheriff to check the anglers’ fishing licenses. The deputy found that their licenses were in order and, because the state said that they had a right to be there, refused to arrest them. Undeterred, Sponaugle tried to sue the anglers in criminal court; the case was dropped, however, because the court found the ownership of the river in dispute. Now Feldenzer and Sponaugle are suing the anglers in civil court—to the tune of $10,000 apiece—for trespassing. Unbeknownst to them when they headed out for a peaceful day of fishing on the Jackson, our two hapless anglers had stepped into what was already a hornet’s nest. In June, 2009, the VDGIF had informed Sponaugle by letter that his posted signs on this mile-long stretch of the Jackson were illegal, the Kraft v Burr decision having no bearing on his property. Because the VDGIF does not have the authority to actually take the signs down, confusion naturally ensued—with dire financial consequences for Coggeshall and Garden, who were relying on VDGIF-provided maps for their outing. Where private property rights and public access and usage rights conflict, we often witness fireworks. The landowners in this case clearly believe that they have an exclusive claim, and they might even be correct. But instead of petitioning the state and following proper channels—onerous as they often are—to recognize their claim to the river bottom, they have opted to sue individual anglers. If the anglers lose their case—or run out of money to defend themselves, which is a very real possibility—it really won’t matter whether the landowners have exclusive rights to the property or not: Anglers will flee the Jackson River altogether just to stay out of court. Now, I’m no lawyer; I’m also a staunch believer in private property rights. But the fact remains that these sportsmen were fishing in that section of the Jackson River because state-printed materials told them they could do so. 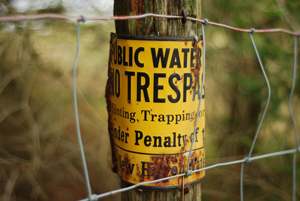 Where private property rights are violated, Virginians expect authorities to act to protect them. Similarly, where public property access and usage rights are, according to the Commonwealth’s own documents, being violated, we expect the authorities to defend them. Civil or no, North South Development v Garden is a critical case with implications for a number of Virginia waterways. The embattled anglers told me that they have already incurred $40,000 worth of legal bills defending themselves against the charge of trespassing on property that the Commonwealth says is public. Concerned sportsmen across the Old Dominion have set up a website to help defray the costs of their defense: www.virginiariversdefensefund.org. Tourism dollars are crucial to Virginia’s economy, and yet state authorities are sending outdoor enthusiasts a curious message: We’ll sell you a license and give you a map, but attorneys’ fees are on you. In other words, fish elsewhere. Reprinted with the permission of the Chesapeake Bay Journal.